Welcome to the beautiful state of New Hampshire! From the heavily forested north country, to its rugged mountains and clear blue lakes, to its historic coast, New Hampshire is naturally a magnet for vacationers. When the snows fall in the winter, New Hampshire becomes a true winter wonderland. Visitors from all over flock to the many mountain resorts, enjoying skiing on spectacular terrain that ranges from novice to expert. Cross-country skiing is also booming, with hundreds of miles of groomed trails weaving throughout the fields and forests. 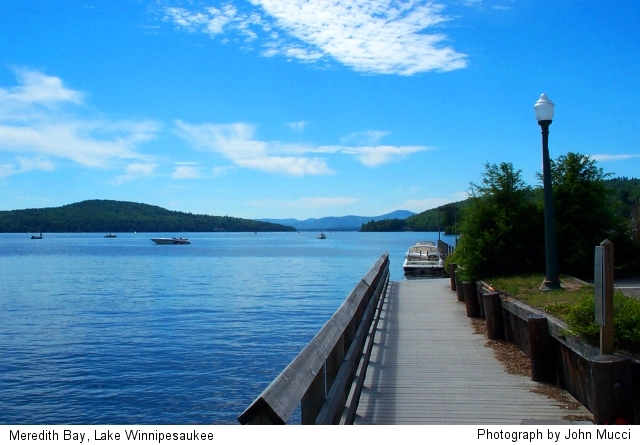 When summer arrives, boaters and swimmers head for the sparkling blue lakes, hikers and campers seek out the beauty of the mountains, and beach lovers head for the ocean. No words can adequately describe what happens in fall in New Hampshire. The hills become a festival of fall foliage color, the days are clear and crisp, the skies of the deepest blue, and the lakes sparkle with brilliant sunlight. Everywhere, there is color; in the fields and forests, on the hills, and in the picture-book villages. Yellows and browns, brilliant orange and fiery red, the changing foliage attracts visitors from all over the world to see this glorious and spectacular display. Under the authority of an English land grant proferred in 1629, Captain John Mason named this land New Hampshire after the English county of Hampshire where he had enjoyed a number of years as a child. Though Captain Mason invested over 22,000 pounds in clearing land, building houses and investing in the defense of his land grant, he died in England, before ever seeing his property in the new world. New Hampshire's most popular nickname, "The Granite State," refers to the extensive granite quarries in the state. Granite is the official state rock of New Hampshire. This nickname refers to the New England rivers that originate in the White Mountains of the state. Major interstate rivers include the Connecticut River, the Pemigewasset River, the Merrimack River, the Androscoggin River, and the Saco River. New Hampshire is called "The White Mountain State" after the White Mountain range the cuts across the northern half of the state. Mt. Washington, in the White Mountain Range, is the highest point in the Northeastern United States. It's also noted for "the world's worst weather." This nickname again references the White Mountains of New Hampshire. Early visitors related the White Mountains to the mountains of Switzerland. People who live in New Hampshire or who come from New Hampshire are called New Hampshirites and sometimes New Hampshiremen and New Hampshirewomen. New Hampshire Natives are defined by law. 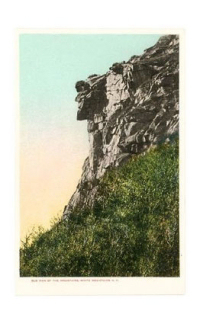 The New Hampshire quarter depicts one of New Hampshire's former greatest natural attractions, "The Old Man of the Mountain," a rock formation found on Mt. Cannon in Franconia Notch. "The New Hampshire quarter will give the rest of the nation a sense of New Hampshire's natural beauty, its rich history and the character of our people,"
New Hampshire (From Sea to Shining Sea) , by Terry Miller Shannon. 80 pages. Publisher: Scholastic Library Publishing (March 2002) Reading level: Grades 3-5. Presents information about New Hampshire's people, geography, history, landmarks, natural resources, government, state capitol, towns and cities, and more. New Hampshire (World Almanac Library of the States) , by Joanne Mattern. 48 pages. Gareth Stevens Publishing (January 2003) Reading Level: Grades 4-6. In addition to an in-depth factual profile of each state in the form of a state Almanac, every book offers fascinating and lively discussions of the state's history, people, geography, government, economy, culture, and lifestyles. Includes a section on Notable People, a calendar of events, and enough primary source documents, time lines, maps, and other tools to make this unquestionably the best young adult reference material on New Hampshire available anywhere. The Granite State: New Hampshire, An Illustrated History , by Ronald Jager & Grace Jager. 231 pages. Publisher: American Historical Press (October 2000) The Granite State: New Hampshire chronicles New Hampshire's unique style with tales of the past and a glimpse into the future in this consummate historical account of 400 years of life in the Granite State. Ronald Jager earned his doctoral degree from Harvard University and has been published in Harper's, Atlantic, New York Times, New England Review and many others. Grace Jager is a history and English graduate of Calvin College and earned her master's degree from Keene State College.